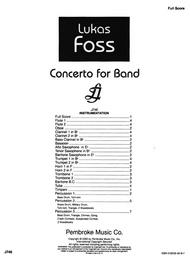 Concerto for Band (Full Score and Parts). Composed by Lukas Foss (1922-). Concert Band. For Flute I, Flute II, Oboe, Clarinet I, Clarinet II, Bass Clarinet, Bassoon, Alto Saxophone, Tenor Saxophone, Baritone Saxophone, Trumpet I, Trumpet II, Horn I, Horn II, Tenor I, Tenor II, Euphonium, Tuba, Timpani, Bass Drum, Snare Drum, Military Drum, Trian. Carl Fischer Classic Band Editions. Score and Set of Parts. Standard notation. 53 pages. Published by Carl Fischer (CF.J746).ISBN 0825849772. With Standard notation. 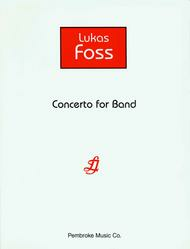 Concerto for Band composed by Lukas Foss (1922-). Concert Band. For Flute I, Flute II, Oboe, Clarinet I, Clarinet II, Bass Clarinet, Bassoon, Alto Saxophone, Tenor Saxophone, Baritone Saxophone, Trumpet I, Trumpet II, Horn I, Horn II, Tenor I, Tenor II, Euphonium, Tuba, Timpani, Bass Drum, Snare Drum, Military Drum, Trian. Carl Fischer Classic Band Editions. Full Score. Standard notation. 53 pages. Published by Carl Fischer (CF.J746F).ISBN 0825849127. With Standard notation.